I just started today to evaluate the usability of dotCover as replacement for PartCover for one of our larger SW projects (C# under .NET 4.0). Our dev process requires to separate the NUnit test code projects from the tested code projects, meaning "no test code in the tested DLLs". So we ended up in dedicated solutions which consist of several C# projects which each contain NUnit test code for a dedicated C# project. The project-to-be-tested is referenced as DLL (from a build server), not as project reference. Is ReSharper mandatory for this (I'm just evaluating dotCover, no ReSharper installed). So, one way to come around in that scenario is to run the NUnit program in the VS solution whoch contains the to-be-tested projects. I activate the target C# project as default project, run dotCover application, select the NUnit gui exe and perform the NUnit tests via the NUnit GUI. After closing, I get the coverage results displayed. Somehow annoying, since I have to have the NUnit test solution opened in addition for a test code development cycle (Modify test class, compile, switch to other VS2010, start dotCover, get results, go back to test code development solution). 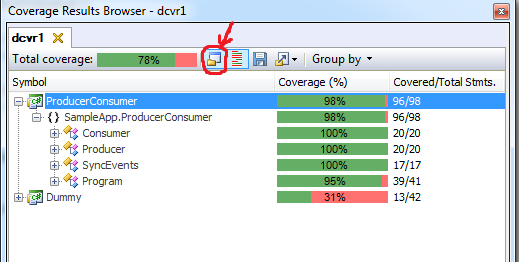 And: I do not get any code coverage shown, when I try to click on the affected method in the coverage display. Do I NEED to have ReSharper installed to achieve this ? If you don't need per-test info and integration features, it is possible to use dotCover without ReSharper. In this case you can choose dotCover -> Cover Application -> Standalone Application and specify path and arguments to your NUnit runner. In this case dotCover shows only those assemblies which match with the projects of the current solution. Disabling this option will show all assemblies. Currently highlighting and navigation features do not work with snapshots obtained on the remote machines. As an alternative you can generate an HTML report on the remote machine, it will contain source code with highlighting.